Bridging the past between the present, Anton del Castillo’s Anatomy to Flight explores how much of the general population appreciated aviation since its inception. Anton del Castillo’s sketch masterpiece, Anatomy to Flight will be on view at Altro Mondo at The Picasso from March 23 to May 29. 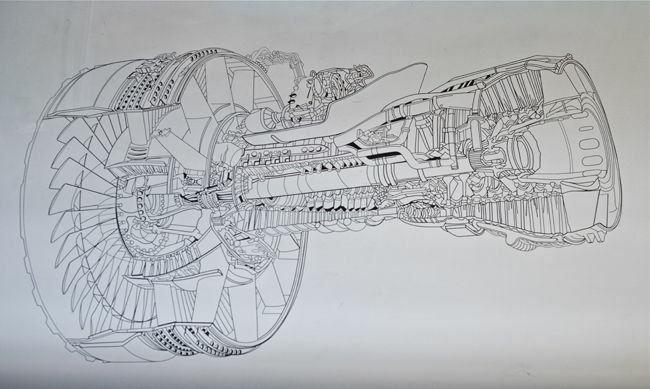 Depicting the mechanical diagrams of an undefined flight transport, Anatomy to Flight is a visual representation of how much the world has contributed in developing aviation. Similar to a blueprint, del Castillo’s masterpiece tries to convey the message of dream-turned-reality and luxury-turned-commodity. Del Castillo completed his BFA and MFA degrees at the University of the Philippines, Diliman and is an assistant professor at the University of the Philippines Integrated School. Del Castillo has received fellowships from the Asian Cultural Council, the Sovereign Art Foundation, and was also the recipient of the International Studio and Curatorial Programme in New York (2006). From Leonardo Da Vinci’s Ornithopter that inspired the design of air transports, to the Wright Brothers’ machine inventions to materialize the theories, the Anatomy to Flight seems like a time capsule that re-imagines the periods in aviation history. The Picasso Boutique Serviced Residences invites art and aviation enthusiasts to appreciate art, history, and the future of air travel.